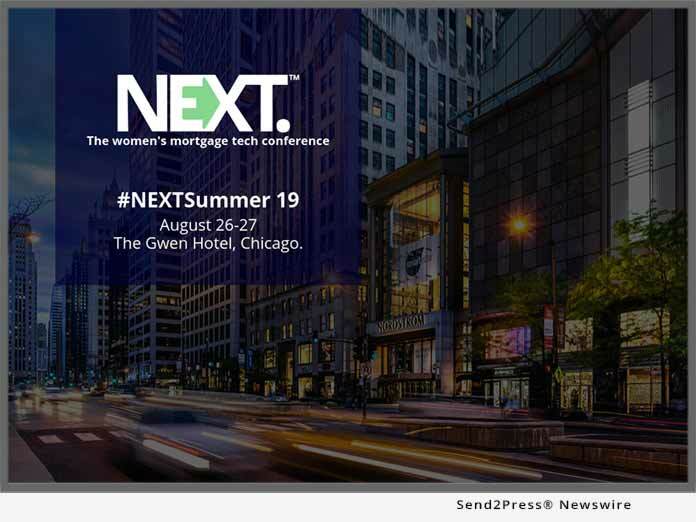 NEXT Mortgage Events LLC, creator of the NEXT women’s mortgage tech summit, has announced its summer 2019 event dates. The event, hashtagged #NEXTSummer19, will take place Aug. 26-27, 2019 at The Gwen Hotel in Chicago. Registration will open to the public in April 2019. EDMOND, Okla. /Mortgage and Finance News/ — NEXT Mortgage Events LLC, creator of the NEXT women’s mortgage tech summit, has announced its summer 2019 event dates. The event, hashtagged #NEXTSummer19, will take place Aug. 26-27, 2019 at The Gwen Hotel in Chicago. Registration will open to the public in April 2019. NEXT is a biannual technology summit for senior executives in mortgage lending. It features lender-centric educational content, with sessions that cover topics such as compliance, production, sales, corporate culture, marketing and operations, among others. In addition to educational content, each NEXT event includes technology showcases and meetings where lender executives can learn about new products and services, and numerous networking events. The event is held twice a year to accommodate its growing demographic and attendee base, while maintaining the intimate, boutique size that is conducive to its unique networking footprint. Priority pre-registration is currently open. NEXT is encouraging its VIP attendees to reserve their spaces before registration goes on sale to the general public, as it anticipates the event will reach capacity well in advance of the August dates. In January 2018, NEXT Mortgage Events broke the mortgage industry’s unspoken barriers that limit women’s access to competitive intel and networking-based information exchange, when it introduced NEXT, the mortgage technology summit for women. NEXT is a two-day, tech-focused symposium based on lenders sharing competitive intel with other lending executives. A boutique gathering, each NEXT event is limited to 200 attendees, and targets a select group of decision-making executives. Roughly 85-90 percent of lender attendees hold a title of VP or higher and approximately 85 percent of attendees are women. NEXT is held twice a year, in winter and summer. For more information visit https://www.nextmortgageconference.com/, follow @NEXTmtgEvents or email info@NEXTmortgageEvents.com.